42 mm pink gold case, 13.67 mm thick, transparent back, silvered dial with appliqued numerals, caliber 383 manual movement with second time zone, hour - minute, jumping hour, day/night indicator, map of the world, seconds, world time, twin power reserve, approximately 50 hours of power reserve, brown leather strap, deployant buckle. Water resistant to 5 bar. 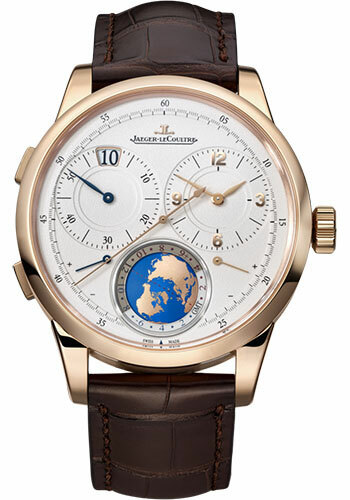 42 mm 18K pink gold case, 13.7 mm thick, pink gold bezel, silver dial with appliqued numerals and feuille hands, caliber 383 automatic movement with hour - minute, seconds, second time-zone, jumping hour, map of the world, day/night indicator, and world time, approximately 50 hours of power reserve, brown alligator leather strap, pin buckle. Water resistant to 5 bar. 42 mm white gold case, 13.6 mm thick, sapphire crystal back, grained dial, caliber 383 automatic movement with hour - minute, seconds, second time-zone, jumping hour, map of the world, day/night indicator, and world time, approximately 50 hours of power reserve, black alligator leather strap, deployant buckle. Water resistant to 5 bar. 42 mm 18K white gold case, 13.7 mm thick, sapphire crystal back, white gold bezel, silver dial with polished black nickel applique numerals, caliber 383 automatic movement with hour - minute, seconds, second time-zone, jumping hour, map of the world, day/night indicator, and world time, approximately 50 hours of power reserve, blue alligator leather strap, pin buckle. Water resistant to 5 bar.